Hpa An – election day. The queues had built up well before the 6am start to vote. There was a quiet buzz around the schools being used as polling stations with families and friends emerging smiling and photographing inked fingers. Everyone said they were voting for the National League for Democracy (NLD) and they were quietly optimistic that the NLD would win. As preliminary results have been announced, nationwide optimism has grown as it appears that the NLD will sweep to power with the fears over the fairness of the election not being realised. The news coverage leading up to and after election has focused on the contest between Aung San SuuKyi and the NLD and the military and Union Solidarity and Development Party (USDP) on the other. The report found, “a distrust in the election process” and a “lack of faith that these elections will truly make a change” for ethnic groups. Speaking to Karen voters in and around Hpa An, this distrust was made clear. A man from HpaAn said that although his uncle had been put on the voter list, he had not received his ballot paper. His wife and sister were teachers who had voted by advance voting, but their voting forms were missing the signature of the polling station supervisor, thus rendering them invalid. Election monitors from the Karen Youth Network (KYN) also spoke of widespread concerns over the fairness of the election. The three monitors echoed issues cited by organisations such as Human Rights Watch that has set out concerns with advanced voting, inaccurate and incomplete voter lists, the independence of the Union Election Commission (UEC), and the cancelation of voting in many ethnic areas (including in Karen State even though a Nationwide Ceasefire Agreement (NCA) has been signed). The delays in announcing results are also concerning and as Karen News has already reported, according to Saw KyawSwar from the Karen State Community Network who worked on the voter education activities in Karen State, “only 20% of [voters] will vote correctly. There are barriers because of illiteracy and lack of voting experience”. So it remains to be seen if the nationwide optimism will be reflected in final Karen State results although the provisional results are encouraging for the NLD with it appearing to have taken 40 of the 51 seats in Myawaddy Township for example. In contrast, it appears that the Karen parties have loss most and possibly all of their seats. Assuming that the NLD does march to power, what are the expectations of Karen voters? None of the voters we spoke to had seen information on any particular policies of the NLD, or exactly what it plans to do assuming it comes to power. Instead, as one voter explained, they did not trust the USDP and were putting their faith in Aung San SuuKyi. A 28-year-old Karen man who had returned to Hpa-an from Rangoon to vote saw the election as a step in a journey towards democracy. His view was that until Burma moved to a federal system, the Karen could not ensure they received equal treatment from the government. He was hopeful that the NLD and Aung San SuuKyi would begin this change and saw the election as being as important as the peace process. He had concerns with the 2008 Constitution, noting the 25% of seats reserved for the army, but still saw the election as a crucial step on the road to democracy and federalism. The KYN election monitors were more adamant that there would be no change for the Karen under the 2008 Constitution, which grants the president the right to appoint state chief ministers and gives very few powers to the regions. They were equally adamant that the peace process offered the only chance for change through negotiations working towards a federal system. They did, however, see the election as part of this journey; their aim on election day was to observe the tricks that might be used to defraud voters and inform the fight for fairer elections in the future. They said they would report any issues, but with the apparent bias of the UEC (headed by a former general who has spoken of his support for the USDP), they had little faith that this would lead to action. Despite this skepticism, one added that the elections could offer progress for Burma as a whole and this in turn could be positive for the Karen. 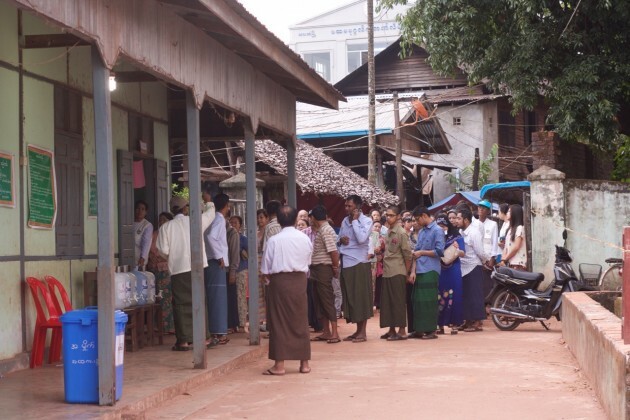 In a Karen village outside Hpa-an, voters’ said that their main concern was being able to work on the land around the village without fear of renewed fighting. A woman who acted as a village representative to the NLD explained that since the NLD had opened a local office, there had been a reduction in fighting and compensation had also been received after land confiscations. The reduction in fighting is perhaps hard to attribute to the NLD and instead is part of the peace process, but the compensation had been received following intervention from NLD representatives. One farmer was concerned that he would again be forced to act as a porter for the Burma Army and another thought that the loosing party might spark fresh conflicts. They both voted for the NLD because they trusted Aung San SuuKyi and had seen the NLD help recover compensation. One woman said she voted for the NLD, but had concerns that the NLD would give rights to exploit Burma to foreigners and had heard that Muslims might cause problems if the NLD was elected. A university student who had returned to the village from studying abroad in order to vote explained that the concerns over Muslims were a symptom of a lack of education meaning that people believed unfounded rumors. He also said that people took time off from work to vote only because they were told to by village leaders, adding that this reflected a lack of any real belief in the importance of the elections. In this particular village, this did not, however, mean that more importance was placed on the peace process. Most people were unaware of the details of the peace process and had not heard of the NCA. It is clear that the 2008 Constitution will severely curtail the ability of the NLD to deliver federalism. The peace process is also inseparable from the Constitution and it is the Burma Army, with its 25% voting bloc that ultimately holds the power to change it. These restrictions will make it hard for the NLD to deliver the results hoped for by Karen voters. With many voting based on trust in Aung San SuuKyi, the NLD will have to ensure that Karen voters are educated about these difficulties if it is to maintain its support.